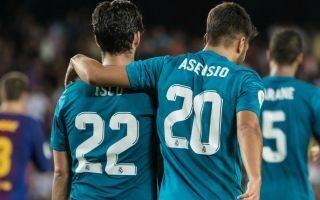 Liverpool are reportedly showing the most interest in sealing the transfer of Marco Asensio this summer, with Chelsea also eyeing up the Real Madrid star. The Spain international is widely regarded as one of the top attacking players in Europe at the moment, and one of the brightest young prospects in general. Asensio seems an ideal fit for either Liverpool or Chelsea right now, and Don Balon claim both clubs are prepared to offer around £88million for the 22-year-old this summer. It is the Reds currently leading the charge however, due to Jurgen Klopp’s growing fear that, despite tying down Mohamed Salah to a new contract, he could lose another key forward in Sadio Mane this summer, according to Don Balon. This follows another recent report from the same source that stated Real Madrid themselves were admirers of Mane, who was one of Liverpool’s best players again last season. The Senegal international may not be as glamorous a figure as Salah, but would be a tough player to replace in Klopp’s side, though Asensio would certainly not be the worst option. Don Balon add that Chelsea want a big-name like the former Mallorca starlet to get them back on track after last season’s hugely disappointing campaign. The report adds that Bayern Munich could also be in contention for Asensio this summer as they eye a long-term replacement for Arjen Robben.